With the arrival of Blab everyone is going Blab crazy! But what about the other newbie, Periscope, and of course Hangouts On Air, and more importantly what about your fans and followers? No one can dispute that video marketing is going to more important than ever as searches on mobile devices overtake those made on a desktop. What would you rather do, click play or read? Producing video for your brand is getting easier now with the number of free live streaming Apps now available. These are the Apps we are using for Genius Loci and our clients. We have deliberately left out Meerkat as it is a platform we do not personally use. Hangouts are still the best for music streaming and YouTube but are desktop based. More complex to set up but they are very powerful and you can achieve full HD video and audio. Branding is also easier with lower thirds and links to your website. The level of interaction is also very high with the ability to use a comment tracker. Hangouts also have a pre-broadcast area where you get guests settled before going public or live. Hangouts do not work well over wifi or mobile. After the broadcast the broadcast is available from YouTube. It is a brilliant platform for reaching your Google Plus and YouTube audience. Periscope works on mobile only and is great for taking people on a journey. Brilliant for any business in tourism. Excellent for reaching your Twitter audience. Broadcast cannot be scheduled, they really are in the moment. I do like this platform a lot. I can take people down a little known path on a secluded beach and with the camera in front of me they are seeing what I am seeing without leaving their home in real time. I can give background info and as it is live they are part of the experience. The fact that it only lasts for a short time adds to that experience. You can download the video after the event otherwise it is available for 24hours via Periscope. Quality is variable depending on your connection and you can attract spam comments. Blab works well on desktop and mobile. Very easy to use, targets your Twitter audience, comment tracker is built in, Blabs can be scheduled and recorded. I also like the fact that after the event you are sent two files – one for video and one for audio. So you can upload to YouTube and use the audio for a Podcast. Hangouts win on picture and sound quality but lose on ease of use. Blab wins on ease of use and being able to set up / join from anywhere. Less bandwidth is required although ear buds are required as without them an echo loop can occur. There is no privacy on Blab so even if you are not recording you are live the instant you start. I have noticed people setting up HOA events but actually broadcasting on Blab, so you can also target your Google Plus audience. Blab works very well on desktop also, but picture quality is not as good as Google Hangouts, but guests joining and following comments is a breeze. The platform is very new and the developers are adding new features almost every day. Camera setting is portrait so if you like having two people in view, it’s cosy! Obviously this is a fast moving area and with Facebook trialling their own live streaming App called ‘live’ – we are in for some interesting times. Hosted by +Phil Aston & +Sue Aston this is a chance to meet up and share ideas, tell people about your business or your latest offers and all without leaving your office! Hangouts are a great way to promote your Tourism business and interact with your customers and guests. We will also be giving digital marketing tips and how to get the most out of Google Plus, social media and the community. We are looking for 5 guests to be on the panel. Full instructions will be given before the event. 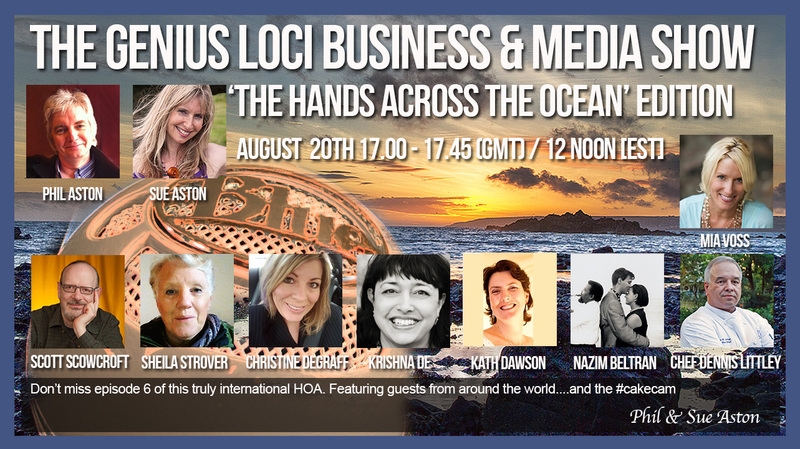 The Genius Loci Business & Media Show are proud to present ‘The Hands across the Ocean Edition’. 1.Showcase or No Case – The Showcase App has been out for a few weeks now, we look at the pros and cons for HOAs and how it can affect interaction. 2. How are HOAs developing? For hosts what things have you changed since you started? For viewers what do you now look out for before clicking ‘yes’? 3. Google Plus is Google – are you sure? – With Hangouts now available for users of Google Apps are we seeing a realignment of Google Plus? Should our focus be on YouTube more than the event page? 4. What is the emotional connection that makes us trust small brands Vs large brands? – Social media (and more recently HOAs) have changed how we engage and build trust. When choosing a smaller business the signals we look for can be very different, from seeing them on a video, their blog posts and even what music they like. Trust is built on our perception and empathy of the individual. For larger brands we are more likely to see an individual as a spokesperson for the brand and so testimonials and a more factual line of communication will work better. It is a good example of how to promote a British brand via a Hangout On Air. This was unscripted and things did go wrong (like the comment tracker) but I felt it was worth sharing with you all. Stevens The Cornish Slate Company sell traditional crafted Slate products all around the world and have embraced social media and HOAs to get their message across. The show was kept to it’s 30min time slot and both myself and Sue Aston did our Breakfast TV approach when interviewing Pat Scully This made the whole show relaxed and more natural. Hangouts On Air are one of the best features on the Google Plus platform. The holy grail for musicians is the option to broadcast their own concerts. The Sue Aston Show, was the first real Hangout Concert broadcast from the UK at this level of quality. We had a lot of comments from around the world about how we set this up. The Violin is a very unforgiving instrument if not set up correctly. For standard Hangouts On Air you can get away with a external webcam and mic but for music you do need an external mixer for the additional control. This first show was broadcast on March 2nd and was watched in the UK, USA, Canada, Australia, Italy, Mexico, Africa. Up until January 2015 this was our set up. This HOA has caused quite a stir in the world of Hangouts and for a music / talk show HOA it is the most complex but successful one I have produced. We had over 230 people in the live feed and also had guests on the panel. The show was broadcast live in the USA and viewed in Japan, Canada, Mexico, USA, Brazil, Italy, Switzerland, Ireland, Africa and the UK. It was the first one where we decided to broadcast in HD Video. We decided to start simple with one instrument and then slowly added more as the show progressed. Towards the end where all four of us are playing I had to leave the production element to it’s own devices. All the above inputs were EQ’d at the mixer stage. Settings were changed from voice to studio throughout. The live HOA mix was monitored via Pro Logic X which gave me a good idea of what people were hearing. The sound was tested on earbuds and large Tannoy floor standing speakers before we went live. The live mix from Pro Logic was also fed into the headphone streams so we could all hear each other! On this HOA we needed at least two more inputs so we upgraded our mixing interface for the next event. The show was broadcast from our living room so microphone bleed across channels was a huge issue. To combat this we placed each of the amps in different parts of the house. This gave me more control over the mix. A lot of the mix was live so different settings were needed for harmonica and spoken voice as was reverbs effects etc. The show was hosted by My Music Hangout in the USA and broadcast from Cornwall. We had a great panel of guests and the comment tracker was doing over time. At one point I had to remind myself we were broadcasting live around the world from our house! There will be times for some people and organisations where your HOA guest is in the same building. What people tend to do is set up another laptop in another room, so that each person can have their lower third and be the main focus when they talk. The background to this was we wanted to gain some experience of doing HOAs but also have something we could use afterwards. The issue was being in the same building we would have to have separate laptops, microphones etc to get the HOA affect of a lower third and separate camera shots (depending on who was talking). We decided to design a special lower 3rd for both of us and use one screen. This is the outcome. We kept it low key but I am pleased with how it turned out. This has given us ideas of doing this double act HOA again either as hosts or guests! We hosted our first Hangout On Air in January for ‘The West Cornwall Business Club* It was a lot of fun, and things did go wrong. I think there is a perception that you have to get everything right before doing this. However, it is not until you try that you see what other things you can do to improve and the other opportunities HOAs can bring to your business. This is going to be a regular monthly event now, plus we are putting together ideas for our own Business and Media Show. As someone said do not let perfection get in the way of progress!